If one’s life is a tapestry made up of life’s experiences then Florence Nash, OLLI’s Poetry Workshop facilitator, is woven in a wide variety of fascinating texture, color, and design. She has a respect for poetry, music to the ears of some, foreign and intimidating to others. Her expertise helps her students give their ideas voice and a familiarity and universality that we all seek. 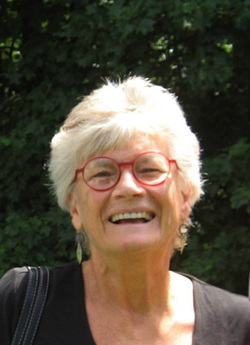 She has made writing poetry a pleasure for hundreds of students over the last 13 years teaching at the Duke Institute for Learning in Retirement (DILR) later to become OLLI. Florence has considered herself a wordsmith from a very early age. She grew up in a home with parents who encouraged the free exchange of ideas, a home filled with books and the language of Shakespeare, Tennyson, and the Bible. She attributes her eventual worldview and fearlessness to her parents, who gave her firm and solid roots, allowing her to experiment with life and love knowing she always had a place to come home to. Nash’s colorful life has come full circle. She is a native North Carolinian, born and raised in Tarboro, graduated from the University of North Carolina in Chapel Hill in 1962 with a BA degree in English, and then ventured outside the safety of her family, to experience a much bigger world. After a year in Paris, Florence returned to the states and landed a job in New York City. She joined the College Textbook Division of Holt, Rinehart & Winston, Publishers. She worked at that capacity for the next four years, diligently learning the ins and outs of being an editor. The mid 1960s were turbulent and full of change. In the midst of the women’s movement new laws were being implemented granting equal opportunity for women. As the first female to become a field rep, promoting and developing textbooks on college campuses, she was transferred to the California Bay Area. She joked that she set back the women’s movement 10 years when she met and fell in love with a young artist/professor, married, quit her job, and within a year gave birth to fraternal twins. From 1969-1970 the family followed her husband to Nottingham, England, where he taught on a Fulbright exchange. The family returned to Europe in 1973-74, settling in Paris, her husband on sabbatical, where Florence pursued her longtime love of music. She took up the flute, taking lessons at a Parisian music conservatory in her neighborhood. She and her husband immersed themselves in French history, literature, art, and music knowing that those were the things that fed a soul. From 1974-1987, the family found themselves in California once again. Continuing to nurture her love of music, she first took a job as secretary in the music department at Stanford. Her heart sang on the way to work. “It was more fun than monkeys!” While there, she completed her MA in Music from San Jose State University. When Stanford music doctoral students were solicited to apply for the part-time job of program annotator for a regional orchestra, she applied on a whim, unexpectedly got the job, and had to confess that she was the secretary and not a doctoral candidate! They hired her anyway. The position opened up new worlds for her. She wrote program notes for concert guides and was able to integrate and mesh exquisitely her love for music and her gift with words. She went on to review concerts for the local paper and annotate programs for performing arts groups. Eventually needing a change from secretarial work, she became Assistant to the Dean of Stanford Medical School. When her children were out of High School and her marriage ended, she decided in 1987 to return to North Carolina. She had come full circle, a rich and wonderfully full circle. Once back in her home state, Florence first worked as assistant to the Dean of the Duke Medical School then as a writer/editor at DUMC on large research projects and as managing editor of a medical journal. Florence is the definition of a lifelong learner for in 1994 she earned her MA in Liberal Studies from Duke University. She continued to support and seek out the arts and humanities and in that search she became acquainted with continuing education at Duke. She agreed to take over the poetry workshop from Barbara Lovell in 2000 and has consistently been facilitating and teaching poetry ever since. She was asked to join The Black Socks, a poetry writing group in the Durham-Carborro-Chapel Hill area. They share, critique, and inspire each other to write the best poetry possible. It’s quite an honor to be a member. I asked when she first became interested in writing poetry. She remembered, early in her California years, going to a reading by a South Carolina poet by the name of Francis Mayes, now best known as the author of Under the Tuscan Sun. At the time, Mayes directed the Poetry Center at San Francisco State University. Her accent and her words touched Florence, who recalled one poem's powerful imagery of a child walking along side a country road in the summertime, the heat burning her feet, the melting tar oozing between her toes. This awoke in her a sense of home and she began to take her writing seriously and began to think of herself as a writer. Others did as well because her awards are numerous. In the year 2000 at Vanderbilt University she was honored as being one of ten emerging poets in the New South. She joked, “I hold the title of ‘the oldest living emerging poet in the South.’” She was chosen by the North Carolina Writers network to be a distinguished reader with the Blumenthal Readers and Writers Award. She has published two of her own compilations of poetry, Fish Music and Crossing Water. Florence co-authored a book entitled, Walter Kempner and the Rice Diet, is a member of the choral society of Durham, and is active with the Osler Literary Round Table at DUMC. When asked what it takes to be a poet, she smiled perhaps thinking of writing her first poem or perhaps the excitement of having it published. Poetry is the power of language, succinct, and yet it has a definite process. First one must generate an idea, then face the issue and make it language, then engage in endless fudging and rearranging of words. A good poem will teach the poet something, something they may not have known abut themselves. “A poem is like a message in a bottle. Grateful to anyone who finds it and excited for what they do with it,” Ms. Nash explained. The poetry workshop is popular with OLLI members. Her class is consistently waitlisted, many people taking the class repeatedly. The group loves having new people join in so that new voices, new ears can find pleasure in the universal experience of poetry. “We laugh a lot, we have fun.” But it seems there is a common respect for one another, a respect for metaphors, and open minds. Nash said, “The difference between poets and non-poets is their eye, the way they see things, the way they observe and interpret the world around them.” If that is true and judging from the choices Florence Nash has made for her life, she can indeed claim to be a poet of distinction. her plumage feather by bright feather. heavy swinging bell of sky.